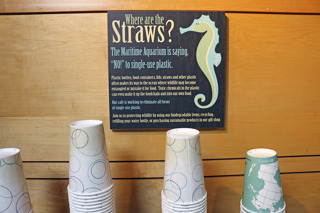 The Maritime Aquarium is doing our part for the environment by significantly reducing our use of single-use plastics. Americans used abo ut 50 billion plastic bottles of water last year. Less than one-third to one-fourth of those bottles were recycled. The rest ended up in landfills or as litter in the environment. 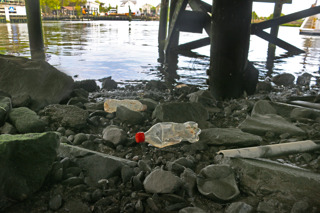 Plastics in the environment never fully decompose. Instead, they break down into smaller and smaller pieces – eventually into microplastics – that remain in the environment. Because of their small sizes, toxic microplastics in aquatic environments blend with plankton at the base of the food web. These microplastics are consumed and work their way up into larger and larger consumers, including humans. An estimated 9 million tons of plastic enter the oceans every year. Plastics in the oceans are so pervasive that a plastic bag, like those offered at grocery stores, has even been found even at the deepest point in any ocean: the Mariana Trench, 36,000 feet below the surface of the Pacific. By the year 2050, by weight, there may be more plastic in the ocean than fish. A recent study in Ireland reportedly found microplastics in 3 of every 4 deep-water fish sampled in the northwestern Atlantic. Those fish are eaten by tuna, dolphin, swordfish and seals, as the contamination moves up the food chain. Another study found that 267 species worldwide – including 44 percent of sea birds and 43 percent of marine mammal species – are impacted by marine debris. Sea turtles are known to swallow plastic bags, mistaking them for jellyfish. The U.S. National Oceanic and Atmospheric Association (NOAA) estimates that plastic in our oceans kills at least 1 million sea birds and 100,000 mammals each year. Recycled plastic bottles don’t become new plastic bottles; they can only be “down-cycled” into lower-quality materials. In order to further educate our guests about the dangers of single-use plastic, we have created displays throughout the Aquarium about Americans’ excessive use of plastic water bottles and the larger problems of plastic pollution in the ocean. During their visit, guests can also easily refill their reusable water bottles at a bottle-filling station near the first floor restrooms. In addition, many changes have been made by CulinArt, our on-site catering company, and Event Network, our gift-shop operator. All straws and plastic soda-cup lids are eliminated. Even paper straws are not offered. Water is now sold in paper boxes, instead of in plastic bottles. Sodas in the Café, and also in the IMAX Theater concessions stand, are sold in aluminum cans. Juices and teas now are sold as boxed drinks and in glass bottles. Coffee cups and soup cups are now made out of a paper coated with polylactic acid (PLA), which is produced from renewable resources such as corn and sugarcane, instead of petroleum. Plates and the containers for hamburgers all made of a sugar-based paper. Coffee-cup lids, knives, forks, spoons, salad containers and specialty-sandwich containers are made from a biodegradable cornstarch-based plastic. Ketchup, mustard and other condiments are available only in large pump containers, for adding into small biodegradable paper cups. Gone are little plastic squeeze packets. Cookies and candies are sold in biodegradable cellophane. Guests’ purchases no longer are placed in a plastic bag. Instead, guests are invited to purchase a reusable tote made from recycled plastic or bring their own bag from home. 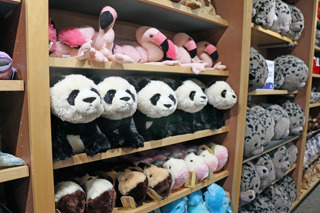 Plush animals no longer are stuffed with plastic beads. Some plush creatures are made entirely from post-consumer plastic bottles. Toys, such as dolls and animal figures, no longer come in boxes covered in cellophane. Acrylic (plastic) sign holders are being replaced with recycled or reusable materials. “Green” products are now emphasized, such as reusable water bottles, eco-jewelry and toys made from materials like post-consumer recycled plastic, metal and sustainably harvested wood. 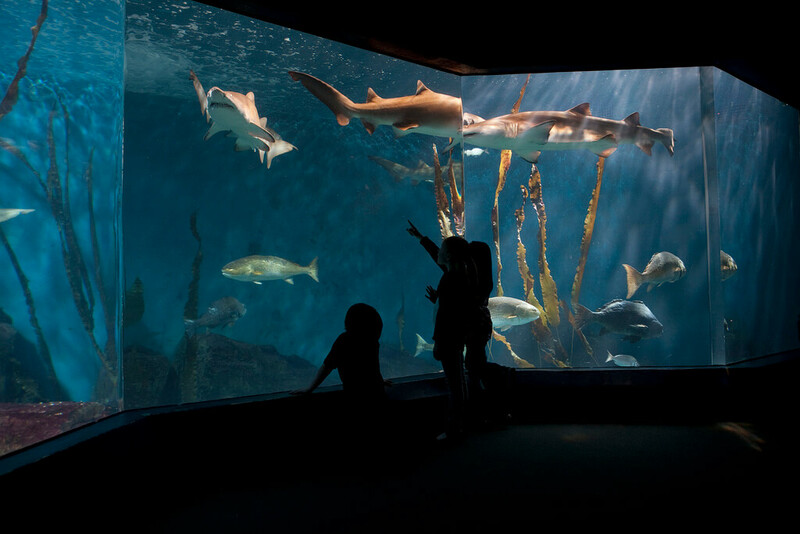 The Maritime Aquarium has a position on local laws that would ban plastic grocery bags, click here to learn more.